Joshua offers a discount of 75% on their first / introductory lesson! 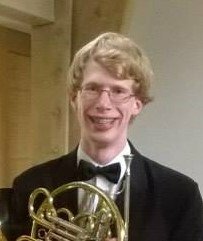 Joshua is an undergraduate student at the Royal Academy of Music, studying under Michael Thompson, an internationally renowned horn soloist. Having been a specialist musician at Wells Cathedral School, one of five specialist music schools in the UK, learning under Simon de Souza, he has received much orchestral, chamber and solo experience. Alongside this he has played in the National Children's Orchestra and National Youth Chamber Orchestra and more recently, the London Mahler Orchestra and the University of London Symphony Orchestra. Although he has had no musical or professional teaching experience, he has casually taught in a variety of subjects, including mathematics, philosophy, EFL and theology. Joshua believes that it is often the simple things that need to be mastered to make a good horn player. So things such as a rich sound, basic technique and a strong sense of musicality will be the primary focuses, with much of the decision-making in the hands of the student, as enjoyment is as much a key element of playing an instrument as anything else.